I know that we’ve talked about spring cleaning a few times now. With all of the messes and things that need to be cleaned, I’ve accrued a nice collection of products that are “specialty” cleaners. There are cleaners for toilets, cleaneres for stoves, special stain removers – you get the idea. Now, there’s a cleaner on the market that does everything you need when it comes to cleaning, the new Dirty Jobs Complete Heavy-Duty Stain Remover. America’s dirtiest jobs have to get clean and My Dirty Jobs, LLC has found a way to clean the messiest disasters of carpet stains, laundry stains or general messes with a brand new line of household cleaning products that gets everything squeaky clean. While there are a lot of dirty jobs around the house – whether it’s cleaning greasy oven tops and microwaves or scrubbing soap scum from shower doors, I decided to put the Dirty Jobs Heavy Dute Complete Cleaner through quite possibly one of the toughest, dirtiest jobs I know – cleaning the oven door. I’m embarrassed to admit how long it’s been since I last cleaned the oven, so I won’t. 😉 But let’s suffice it to say that it’s been awhile, which has offered ample time for dirt and grease and grime to pile up on what was once crystal clear glass. 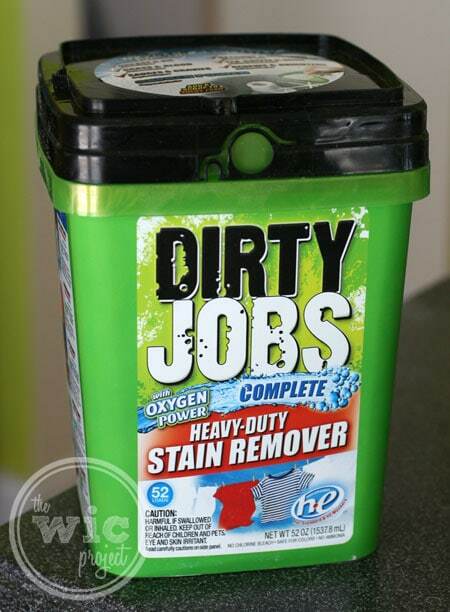 Sounds like the perfect test for Dirty Jobs Complete Heavy-Duty Stain Remover and it’s uber Oxygen Power, right? Right. I opened the door, and applied some of the Dirty Jobs cleaner, then mixed in some water, creating a paste-like texture that I rubbed onto the oven door and let sit for a few minutes. (Note, that isn’t part of the official instructions, but I thought it helped provide time for the stain fighting powers to work.) Then, I grabbed one of my scrubber sponges and added a little bit of elbow grease. I was amazed at how quickly some of the grime and grease stains disappeared from the door. 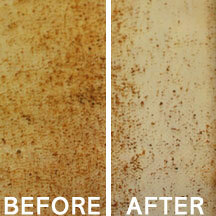 You can see a before/after shot of the results after just a few seconds (may 30 seconds) of scrubbing. I would say that’s a pretty amazing cleaning job. Next, we went into the laundry room to see how effective it is at removing laundry stains. I used a dirty, greasy kitchen rag as my test cloth. Simply add a measured scoop of the Dirty Jobs Complete Heavy-Duty Stain Remover to your load to help get your clothes cleaner. 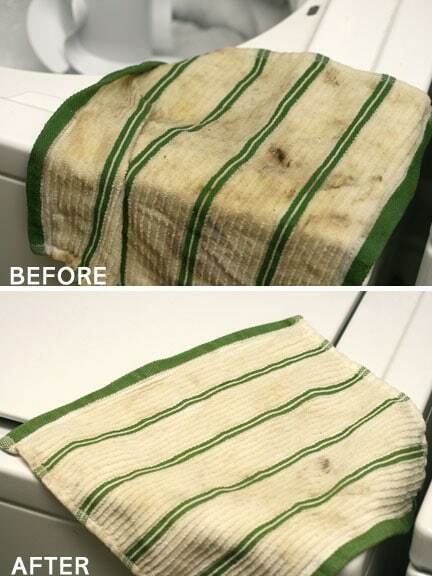 I was amazed at how well it cleaned the kitchen stains from the rag. There was one stain that was a little tougher, where I should have used the Dirty Jobs cleaner as a stain remover first, letting the oxygen power do it’s thing for awhile before washing, but the results were still impressive. I was pleasantly surprised at how well the Dirty Jobs cleaner actually cleaned so many dirty jobs. With a higher concentration of oxygen powered enzyme than any other stain remover on the market, it attacks stains but is gentle on fabrics and other hard surfaces. It makes sense that Mike Rowe from Discovery Channel’s Dirty Jobs would want to get involved since the products are so effective at addressing dirty. To check out the new Dirty Jobs cleaning products, you can find the full product line in Walmart stores nationwide. You can also purchase the Dirty Jobs Heavy Duty Multi-Surface cleaner online through Amazon. One winner will receive the Dirty Jobs Heavy Duty Complete cleaner! The toughest Dirty Job I have is by far my kitchen. It seems like no matter how much I clean it, it’s always dirty! My toughest job would certainly be my oven. It has not been done in…. well, as long as yours! It’s been a while!! The toughest job was when I had a thermos full of hot cocoa and we forgot to empty it. Well someone put it on top of the kitchen cabinet thinking it was empty and clean. Months later it exploded while we were gone. Nasty smelling cocoa everywhere! It sat there for 2 days at least. YUCK! My shower and the oven are the too worst things to clean. The kitchen or the bathroom. they both irritate me equally. the shower walls and tub, especially the textured floor of the tub! The toughest job? My kids laundry. I don’t know where they find it, but the dirt and grime is yuck! My kitchen, I constantly have dishes and my washer and dryer is also in my kitchen and my kitchen is small but I constantly cleaning my kitchen. What about nicotine???? On like plastic, like in the backcover around a shower…..I have tried everything? The toughest dirty job I have to clean is the tub, it seems to get dirty quickly. One of my toughest is greasy towels from cleaning up electric skillets and similar appliances. My shower grout- it is impossible to keep clean. My kitchen is probably the dirtiest job. I have a dog, 2 cats, and a husband. I’m cleaning something in there 25 x’s a day! The bath tub! My husband works at a garage and he’s very greasy when he comes home! To be honest, my toughest cleaning job is usually the bathtub, with all the showers and b aths everybody takes, it’s hard to keep it clean and from getting that soap ring around the bottom of the tub! Worst or dirtyist job is those seams in m shower. I clean the tub/shower weekly but wait 4-5 months to get into the seams. The oven and my shower. the toughest job would be my shower. the people here never cleaned it before us and the landlord should have replaced all the tiles. it is gross. My rags that I use to clean out my oven or the grill are the messiest I have cleaned yet. my husband does work on machinery so grease is a huge factor in our bathtub, I have tried so many of the best cleaning products and it almost impossible to scrub off, but with the dirty jobs cleaning products it doesn’t make it seem hard at all. My toughest job is all the dirt/mud from my dog! Towels, sheets, couches – you name it, he’s dirtied it! My toughest job is getting my husband’s work clothes clean. The toughest Dirty Job I have to clean in my home is my daughter’s school uniform. Ugh, she is always spilling her lunch on her uniform. i have 7 pomeranians ever clean after birth out of a play pen? The oven is definitely the worst, especially the broiler. Ugh. The oven is the worst. The shower is the worst. Carpet, I have 3 cats and a dog. I NEED this! My stove top and the dishrag I try to clean it with. This sounds like it would really work well with these two things. Probably cleaning up after our elderly cocker spaniel, who has accidents pretty often. ewwww… my garage floor. just AWFUL. Dog throw-up. My German Shepherd male got into some raw chicken – oh’ it was a horrid mess I will never forget. The oven and stove seem to be the hardest things to clean. The oven/stove are the hardest for me to get clean. The toughest job is getting red clay stains out of white socks. Kitchen Dishcloths are never new looking!! they need help. Keeping anything clean in the kitchen is hard from the oven to the floors I am forever cleaning! The accidents my still being potty trained puppy has in the house. The dogs’ outdoor bedding is our worst job. Carpets – they beige and I have 2 black dogs…ugh! For me it has to be the stove. Thanks! I’m torn between my husbands clothes (grease, woodchips, paint, etc) and my one year old’s everyday messes! Definitely the stovetop, I get kinda lazy about cleaning it and stuff just gets cooked on. Son on the oil rigs – believing that it will tidy them up real quick ! My dirtiest job is when I use the weed trimmer. I have a 3 year old boy, and a 2 year old dog. Need i say more? My 2-year old daughter who wants to be naked all the time, which results in accidents galore. My dog’s laundry is the toughest dirty job around the house. The laundry is the toughest dirty job around the house. We live in NC and have two dogs. We have that red clay soil here and it’s almost impossible to get out of socks!! Hate it. My toughest Dirty Job has got to be my oven. I have two teenagres that love to cook. The problem is they leave behind a mess in the oven. For me, it’s the tubs and showers. my couch since it’s always being dirtied by my 3 year old and now we have a 3 week old. I have to say my bath and kitchen floors…..This is probably because cleaning them is my least favorite chore!!! the dirtiest job is of course the bathroom, two grown men and a grandson cause a huge mess! I bought an old stove at a sale & when it looked clean but when I took the top off…yuck! 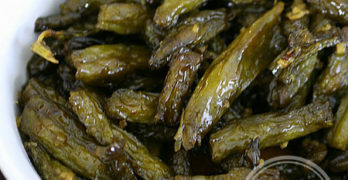 Pure lumps of grease & hunks of old food! I cleaned to 2 days before I felt ok about using it. Def the oven! The worst! Right now, our stove is pretty disgusting. the refrigerator. ,my kids think spills just magically disappear on their own. Behind the stove, on top of the cupboards in the kitchen – both disgusting. definitely the oven and stove. My dog’s blanket & bed… UGH! Definitely my oven! Speaking of, I dropped a hot Pyrex dish a few months ago. My food literally caked on the bottom of my oven. I still don’t have it all off … and I scrubbed for hours that night! My toughest job I have to clean in my home would have to be the grime in the bath tub, around the caulking. Really disgusting. Probably the filters from my stove vents! 2X Toilets.. I hate that job!! Cleaning anything that has sat around the stovetop counters. It seems to get filmed in a sticky grease that is a pain to scrub off. Thanks for the giveaway. For me, it is always the bathroom. The toughest job I have is my child’s bedroom carpet! Hard water stains in toilets. My toughest dirty job is some of my daughters clothes, mostly grass stains. i hate hard water, it leaves scale everywhere and you need CLR to remove it. I will try it every where it’s possible. If it’s good, I will take about it. Hello, how are you? Thank you for this opportunity. Cleaning up after our pets is the hardest and dirtiest job. My floors! Somehow, they get dirty all the time! Thanks for the giveaway…our monthly cleaning of our kitchen exhaust fan is a tough cleaning job i.e. grease & dirt on metal . My computer room probably due to hoarding. Around our tub – there is some nasty stuff, and I hate to clean it!